After weeks of maddening price stability, the price of Bitcoin has jumped nearly ten percent today. 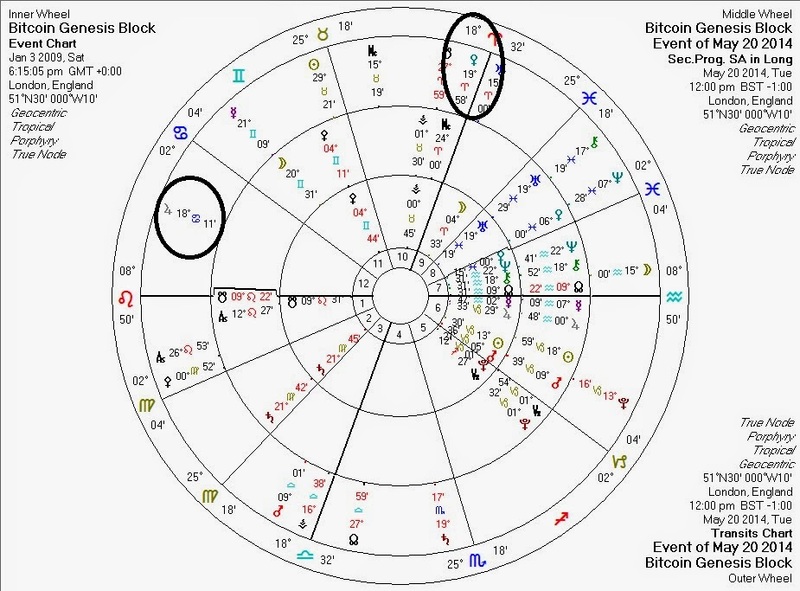 The astrology shows transiting Venus conjunct the MC for Bitcoin's genesis block chart, and transiting Jupiter square the same point. This suggests that today's peak may be relatively temporary (Venus moves fast) but perhaps some gain may remain after Venus is done, from Jupiter's movement. This also tells us that London (which we've been using) is a more likely location for the chart than the proposed alternative of Dublin, Ireland. The Dublin chart puts the MC a full six degrees earlier; this chart would not explain today's rise.